SIZE: weight about about 1.2 pounds (540g). Its crown-to-rump length is about 8.4 inches (21cm). Mother's Size: Uterus now about 1.5 to 2 inches (3.8 to 5.1cm) above the bellybutton. It measures almost 10 inches (24cm) above the pubic symphysis. 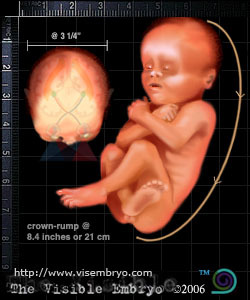 Fetal brain waves begin to activate auditory and visual systems, both mouth and lips show more sensitivity. Eyes respond to light, while ears respond to sounds originating outside uterus. Permanent teeth buds appear high in gums. Nostrils begin to open. Reflex movements improve. Blood vessels start to develop in lungs to prepare fetus for life outside the uterus. These bloods vessels will eventually exchange oxygen and circulate it to tissues. Air sacs, alveoli, have developed in lungs and begin to produce surfactant, a substance that keeps the lung tissue from sticking to itself. However, lungs are not completely ready to breath air. Finger and toe nails continue to grow. The spine consists of 33 rings, 150 joints and 1,000 ligaments, supporting fetal body weight as it develops and strengthens.